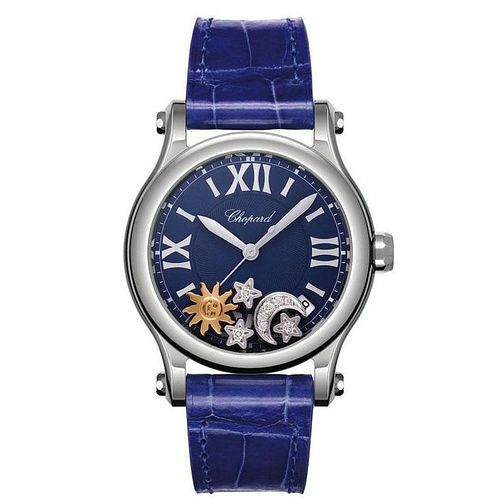 Add colour and character to your wristwear, with this timepiece as part of the Happy Sport collection by Chopard. With a sleek stainless steel case and bezel, this watch boasts a rich midnight blue dial, with silver tone hour markers, three hands and a date aperture positioned between the 4 and 5-o-clock marks. Five fun and fashionable charms are also proudly presented upon this dial. From shimmering stars to a shining sun and sparkling crescent moon. With a blue leather textured strap, watches like this only come around once in a blue moon!